What to do with broccoli? Pad see ew: This was one of my favourite dishes when I visited Thailand and that’s saying a lot as the food there is amazing. It sounds simple – thick rice noodles, broccoli (or chinese greens), eggs and a soy-based sauce, but when you get the combination right it is so much more. This step-by-step recipe from Chez Pim explains everything you need to know to make it in your own kitchen (she also has a fab Pad Thai recipe that could also use broccoli). Quiche: I won’t waffle on too much about my love of quiche again – but broccoli is definitely a perfect partner for eggs and cream so this is another no-brainer. Or just steam or briefly boil the broccoli and top with hollandaise and a poached egg for a quickie meal that also takes advantage of this awesome combo of flavours. Wholewheat pasta with lemon, walnuts and feta: This is a slightly more unusual dish but it comes from the vegetable-queen herself, Alice Waters of Chez Panisse, so you know it’ll be great. The original version with cauliflower is also beautiful, but it works very nicely with broccoli too – a must try. Sesame noodles: Broccoli and peanut sauce is another classic combination and this recipe is the closest I’ve found to the epic sesame noodles you get in American Chinese restaurants. Just boil some chopped broccoli with the noodles for the last 2-3 minutes and you’ve got a super-quick and delicious supper or side dish that’s just a bit more interesting than your standard stir fry option. 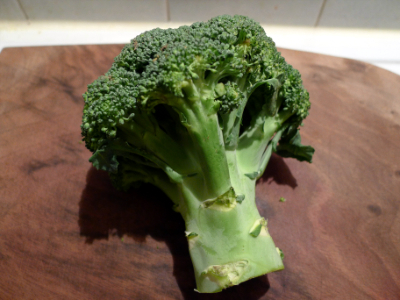 As a bonus here’s a recipe for a healthy, new-years resolution type broccoli salad. It feels good for you and it taste good too, what more can you ask for in January? Cook the rice according to its instructions (boil for about 30 minutes). Make about 100ml of dressing with the ingredients listed. I like mine quite vinegary and sweet as this will be diluted once it’s on the salad. 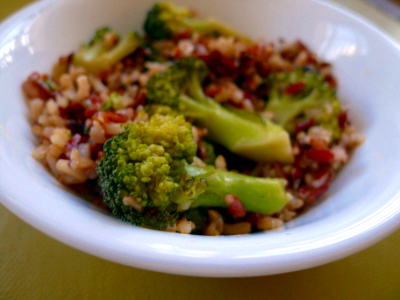 When the rice is almost cooked, add the chopped broccoli to the water and boil for the last 2-3 minutes. Drain rice and broccoli and run cold water over it to stop further cooking. Place in a bowl and add the dressing immediately and mix well. The flavour soaks in best while the rice and broccoli are still a bit warm. Add the raisins and top with nigella seeds to serve. I love broccoli, so thanks for these recipes! !